Make your '93-'97 Chevrolet Camaro or Z28 tough looking with this "Hot" 30th Anniversary Style Flame Graphics kit. These graphics are uniquely designed with reverse flames emitting from the factory vents and a classic .25" (6.35mm) pinstripe border as shown. This stripe package is not just a set of 10" (25.40cm) straight strips in a box. Our graphic kit consists of prefitted and contoured pieces as shown in the illustration. 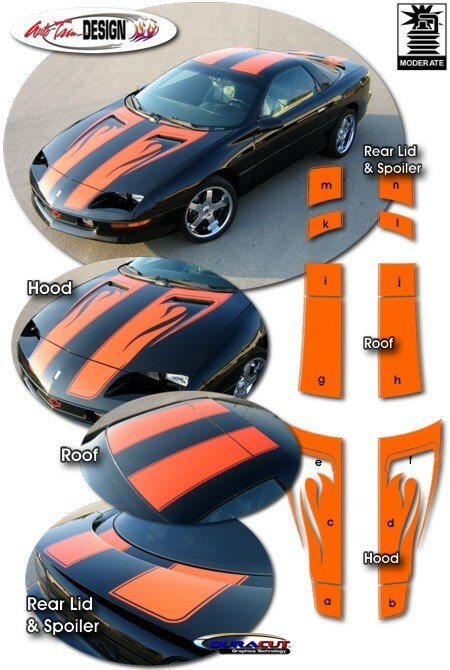 This kit is specifically made for the '93-'97 Chevrolet Camaro or Z28 with hood, roof and spoiler styles as shown and will not fit any other vehicle. Stripe package is set for a center spacing of 10" (25.40cm) as shown.